BASSETERRE, St. Kitts, December 6, 2018 (Press Unit in the Office of the Prime Minister) – The strong fiscal position of the Government of St. Kitts and Nevis has led to the decision by the Team Unity administration to give an extra month’s pay, popularly known as a “double salary,” in December to all civil servants for an unprecedented third consecutive year. Prime Minister and Minister of Finance, Dr. the Honourable Timothy Harris, made the announcement during a national address on ZIZ Television today, Thursday, December 6, 2018. “The Cabinet of Ministers, of which I have the privilege of being the Chairman, has considered and determined, based on the excellent assessment of our fiscal health, that Government employees will receive, for a third year in a row, a double salary on December 14th,” Prime Minister Harris said. 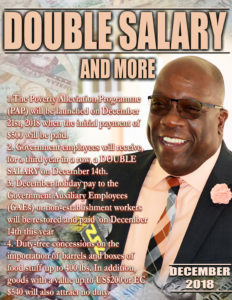 The “double salary” payment will apply to all employees of the Federal Government, including the Government Auxiliary Employees (GAE) or non-establishment workers, persons on STEP, pensioners, faculty of the Clarence Fitzroy Bryant College (CFBC) and employees of the Nevis Island Administration (NIA). “Statutory Corporations such as SKELEC, SCASPA, NHC, the Tourism Authority, etc. have also been encouraged to make payments to their employees,” Prime Minister Harris added. “This will be the 4th year in a row under our administration that the country would have recorded positive growth,” Dr. Harris said. “The healthy fiscal position of the Government indicates that we have achieved the best ever debt-to-GDP ratio over the past twenty-five (25) years,” Prime Minister Harris added. St. Kitts and Nevis achieved the milestone of becoming the very first independent state in the Eastern Caribbean Currency Union (ECCU) to bring its debt-to-GDP ratio in line with the international benchmark of 60 percent – 12 years ahead of the Organization of Eastern Caribbean States (OECS) target date of 2030.